Pseudogout, also called calcium pyrophosphate deposition (CPPD), is a form of arthritis that commonly affects the knees. It is characterized by the sudden and painful onset of swelling in one or more joints and is similar to gout. Symptoms can occur very quickly, sometimes over a few hours, and remain for approximately three to 10 days. Gout is a condition that more commonly affects men, and can sometimes run in families. It is caused by small crystals forming in and around the joint due to an accumulation of uric acid in the blood. Uric acid is a waste product that is created when the body breaks down purines, chemicals that are present in the nuclei of plant and animal cells. In humans, purines are categorized as endogenous purines, which are made by the body, and exogenous purines, which enter the body through food. As such, foods that are high in purines (such as alcohol, meat, and shellfish) should be avoided if a person has gout to limit the amount of uric acid the body produces. Pseudogout is so named because of its clinical similarity to gout. However, pseudogout is caused by a different kind of crystal, called calcium pyrophosphate crystals. Additionally, it is not connected with diet or alcohol consumption, as is the case with gout. It is not clear why the calcium pyrophosphate crystals form, and not everyone who develops crystals in their joints will experience pain or swelling. Painful ‘attacks’ of pseudogout may be due to the release of calcium pyrophosphate crystals into the joint fluid attracting white blood cells. A mutant ANKH gene located in chromosome 5 has been studied for its link to familial cases of pseudogout. The ANKH gene is responsible for encoding a transmembrane transport protein that generates extracellular inorganic phosphate, which facilitates the growth of pseudogout crystals. Accumulation of iron in the joints has also been identified as a possible contributor to pseudogout development from reports of the condition in patients with iron overload from transfusion hemosiderosis and hemophilia. Pseudogout onset is characterized by hot, red, and swollen joints that are painful to move. Symptoms will usually develop suddenly. Although gout can produce tophi, white bumps under the skin caused by the crystals themselves, bumps caused by pseudogout crystals can usually only been seen by X-ray. To diagnose pseudogout, the doctor must be able to rule out other conditions such as gout, rheumatoid arthritis, and joint infections. A discussion of the patient’s symptoms will begin the diagnosis. Blood tests, tests of the joint fluid, and imaging of the joint itself (ultrasound, X-ray, CT, or MRI scan) will show whether calcium pyrophosphate crystals are present in the joint. Increasing age is thought to be a main risk factor for pseudogout. Approximately 3% of people in their 60s and 50% of people in their 90s will be affected by calcium pyrophosphate crystals. 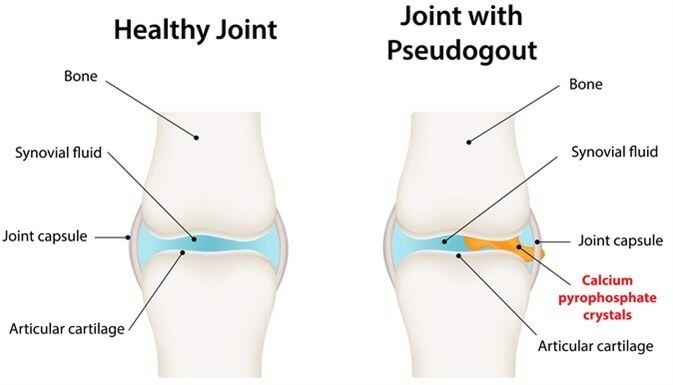 A history of injury to the affected joint or a family history of the condition can also contribute to a person’s risk of developing pseudogout. It can occur after a person has had pneumonia, heart attack, stroke, or surgery. Pseudogout has also been seen in people with thyroid problems, with high levels of calcium and iron, and in people with problems with the parathyroid glands. There are no treatments available for eradicating crystals in the joints. Nonsteroidal anti-inflammatory drugs (NSAIDs) are commonly prescribed to ease pain and swelling in acute attacks. For patients who cannot take NSAIDs, such as those with impaired kidney function, a history of stomach ulcers, or patients who are taking blood thinners, the joint fluid may be drained. Corticosteroids may be injected into the joint instead of using NSAIDs to treat pain and swelling. In rare and severe cases of pseudogout, surgery can be carried out to repair or replace joints damaged by the condition. Studies have shown that transmembrane-transport inhibitors have reduced the production of extracellular inorganic phosphate in vitro, but there has been no evidence of the same effect occurring in humans. Treatments that directly target transmembrane transport, and treatments that directly target calcification in the joints may have the potential to treat pseudogout. Additionally, an interleukin 1 beta antagonist has been used to reduce inflammation. Psuedogout is clinically similar to gout with respect to symptoms. However, the type of crystals that form in the joints in pseudogout are different from those seen in gout. 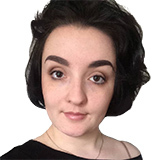 The risk of developing pseudogout increases with age and is it thought that incidence rates of pseudogout will increase with an increasing ageing population. Treatments generally focus on symptom management over disease eradication as it is currently not possible to remove pseudogout crystals from the joints.